[New England Stone] A registered trademark for a coarse grain, beige granite with black and white markings. Kershaw® granite is quarried in Kershaw, south Carolina. 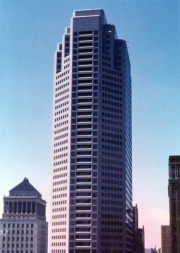 It has been used for the Virginia State Library in Richmond, Foley Square Courthouse in Manhattan, and the Southwest Bell Building in St. Louis.